Desert Hot Springs is a dinky working-class town in the California desert strewn with 1950s motels, many of which have been renovated and are now hideaways for Hollywood’s holidaying elite. The desiccated landscape is all red rocks and scrubby creosote bushes and looks more like Mars than anything you would expect two hours east of Los Angeles and only 20 minutes from the golf-course oasis of Palm Springs. On a bumpy unmade road at the end of town is the building everyone is talking about and which attracted 6,000 visitors in one day when the doors were opened to the public last year. This house, with massive steel planes that cinematically frame the landscape, isn’t just a style statement; it is an experiment in affordable architecture by one of Los Angeles’ hippest architecture firms. In its 17 years Marmol Radziner has designed six spaces for fashion designer Tom Ford (including his London home), and restored both the iconic Richard Neutra-designed Kaufmann house in Palm Springs (the poster house for the California Modernist Movement with its giant plate-glass walls and indoor/outdoor feel) and the Rudolf M Schindler residence in Los Angeles (now the MAK Center for Art and Architecture). But it is their new Desert House that they are most excited about. It is their first attempt at creating an affordable prefab home. With prefab, the entire house is made in a factory and arrives on site with all the interior components, including wiring and plumbing, ready installed. Like many American firms, Marmol Radziner is looking to prefab as a way to staunch spiraling construction costs. ‘With standard on site building techniques we can do less and less architecture for the same price,’ Leo Marmol, one of the two partners in the firm (the other is Ron Radziner), says. Marmol, his wife Alisa Becket and their seven-month-old baby Emilia are the guinea pigs for this project. By living in this prototype, Marmol is hoping to iron out any problems that might arise. ‘One of the big advantages of prefab is it takes significantly less energy to build than a standard structure,’ he says. ‘You don’t have a hundred people driving out to the site everyday for months.’ Instead, the 10 steel modules that form the house and its decks were trucked to the site in the middle of the night. ‘We were staying in a nearby motel, but I couldn’t sleep – I thought the house would tip off the lorries,’ Alisa says. But in a matter of days, the 10 pieces were craned into place and bolted together like a giant puzzle. ‘The neighbors probably think we are insane living in a glass see through home,’ Alisa adds. She is no stranger to living without curtains. Her grandfather was Welton Becket one of LA’s most influential architects, who helped design the Capitol Records Tower, the Theme Building at LAX airport and the Dorothy Chandler Pavilion. In the late 1960s he ran the biggest architectural practice in the world. ‘I grew up in a house very like this, all glass and steel,’ she says. 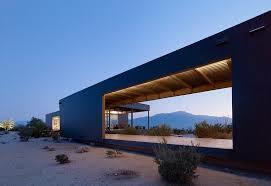 The 2,000 sq ft interior of the Desert House is split into two halves. In one wing are the living room, kitchen, master bedroom and bathroom, in the other are the guest bedroom and Marmol’s art studio. Linking the two is an outdoor living-room. It is Alisa’s favorite space. ‘I love the desolate nature and although it looks dry, flat and brittle, it is really lush,’ she says. ‘ Unfortunately the Jackrabbits here have been eating our landscape. They get up on their hind legs and chew all the trees’. Two of the main problems the Marmols have encountered in their new home are a lack of storage and the impracticality of having an open-plan interior when you have a baby. Both are easily solved, according to Leo. ‘The good thing about prefab is floor plans really easily reconfigure,’ he says. So they are dividing the master bedroom in two. Emilia will have her own room in one half of the space, and Leo and Alicia with have the other half. Doors will separate the two spaces and a wall of cupboards will be concealed behind the master bed. The house has many green elements. All its electrical power is derived from solar panels. 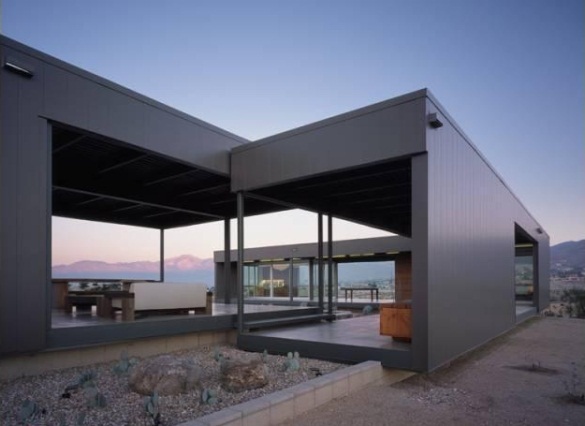 The exterior metal is isolated from the interior metal so that outside heat and cold don’t translate inside (the desert can top 100F during the day and drop down below freezing at night). The glass sliding doors are made of an argon-filled insulation glass that lets in only 16 per cent of UV rays (normally glass allows 77 percent to pass through). The architects are so pleased with their design and the overwhelmingly positive response, they have already started work on eight more prefab houses for clients. They have also opened their own prefab factory to guarantee the quality of the construction. But what remains uncertain is whether a house that rolls out of a factory can ever be quite as attuned to local conditions as a custom site-built home. There is a reason that the Marmol’s neighbor in Desert Hot Springs lives in a bunker-like shelter surrounded by a protective concrete wall. Desert rats like their privacy, but they also like strong protection against the biting desert winds. Just after Leo and Alisa moved in, they opened their living-room doors and the wind whipped inside, knocking all the glassware off the kitchen shelves. Now the display items are all sturdy Heath Ceramics instead.